Easter is just around the corner, and ya’ll know I would never pass up the opportunity to do a holiday tablescape! 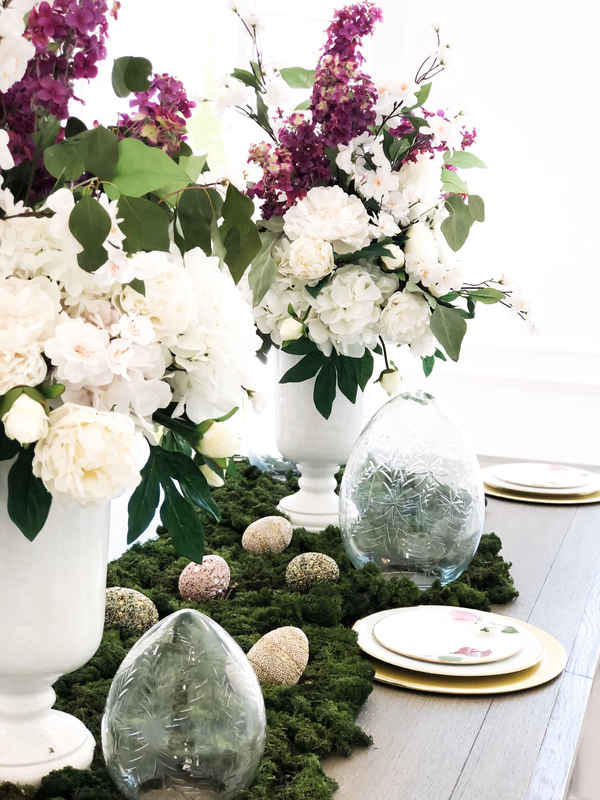 I usually keep my Easter décor to a minimum – aka just in the dining room, and even then I incorporate a distinct spring vibe to offset the bunnies and eggs. For me, Easter kind of symbolizes the coming of spring (even though I feel like it’s so late this year! ), so I like to use a ton of florals and natural elements. This year, Pottery Barn really killed it with their Easter décor items! They have so many great faux florals right now, as well as these adorable beaded eggs and etched glass eggs which I used on my tablescape. I used about 60oz of reindeer moss to create the “runner” effect for the table. I love moss because it’s such an easy way to incorporate a natural element into your décor, and I’m always using it in the spring and summer. The best part is it keeps so well! I actually already had all of this on hand, and I’ll just repack it in Ziploc bags when I’m done! I created the faux floral arrangements using stems from Pottery Barn and Michael’s. You can shop the exact stems I used and the exact vase at the end of the post. I also created a quick and easy video tutorial to demonstrate exactly how I created these arrangements! CLICK HERE to view it! By now you guys know that I’m a major glassware/dinnerware/serveware addict! I never met a unique plate set or glasses set that I didn’t like! So, I always jump at the chance to use my more unique items. These floral Kate Spade plates were on our wedding registry and I just love them! They are the main focus of the place setting and so easy to mix and match with other dishes and chargers. I think this would be so cute topped with these grass place card holders or napkins folded in this adorable bunny design. I used this fold for Easter brunch a few years ago and it was such a hit! Easter is my last major holiday for which I do themed décor until fall! So, now I need to know — which was your favorite from this past year?! 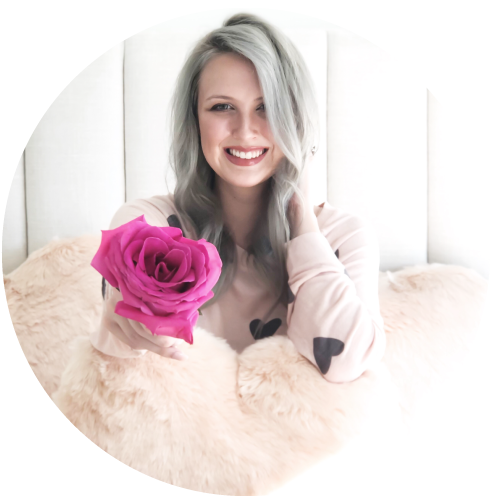 The Easter tablescape in this post, my GALentine’s Day party décor, my Christmas winter wonderland, or my fall harvest décor? ?